The Zoology Department offers four different majors to suit various interests. 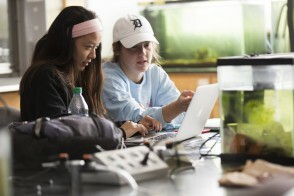 Although most majors begin with the same core courses, each has features that offer special preparation for a variety of fields, such as medicine, environmental science, genetics and molecular biology, biomedical engineering, neuroscience, K-12 teaching, museum curatorship, animal care, and more. All faculty members in the department are academic advisers and all are available to help you select courses and chart your path. Diverse course offerings. A wide variety of courses span the biological world from the molecular to the organismal to the ecosystem. All courses include both practical and theoretical approaches, most have an in-depth laboratory component, and many include significant fieldwork. In addition, the department regularly offers travel-learning courses with destinations such as Tanzania, Costa Rica, the Virgin Islands, Ecuador, and others. Excellent facilities and equipment. Included are a digital UV-imager, a fluorescence microscopy laboratory, a scanning and transmission electron microscope laboratory with full-time, expert staffing, real-time thermal cyclers, and fully outfitted, modern molecular biology labs. In addition, the department oversees and maintains a research museum and two nature preserves. Active student-faculty research collaborations. Ongoing research in our department spans the biological spectrum. Students commonly present their research findings at local, regional, and national scientific conferences and contribute to manuscripts published in a variety of peer-reviewed journals. Strong support for student internships. Recent Zoology graduates have done internships at a number of zoos including the Columbus Zoo and Aquarium as well as at veterinary clinics, wildlife centers, university research labs, hospitals, and other allied health settings. Students interested in the study of biological processes may be interested in the Biology major, which combines courses from both zoology and botany/microbiology. The Biology major can be declared in either the Zoology department or the Botany/Microbiology department. 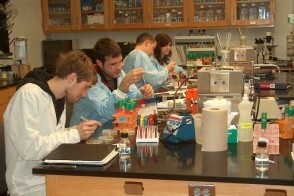 The Genetics major combines courses from both zoology and botany/microbiology. Students will take courses ranging from molecular genetics to cell biology to plant physiology. The Genetics sequence can be declared in either the Zoology department or the Botany/Microbiology department. Students who major in general zoology are interested in the study of human beings and other animals, but perhaps do not want to pursue a professional career in medicine or zoology. The Pre-Professional zoology major is more suited for those preparing for medical school. Often general zoology majors choose to double major in another discipline. The pre-professional zoology sequence will satisfy the entrance requirements of almost all graduate programs in biology or zoology as well as meeting most of the prerequisites for medical, dental, and veterinary medicine schools. Five unit courses in Zoology, at least three of which must be upper-level. Five unit courses in the biological sciences with at least two units from BOMI (at least one of which must be non-cross listed) and two units from Zoology. At least two of the courses must be upper-level. This minor may be declared in either the Zoology department or the Botany/Microbiology department. Identify an OWU faculty member associated with the Food Studies minor to serve as their mentor; create a proposal, in collaboration with their mentor, to the food studies faculty contacts, outlining courses and projects that fit with their specific interests in food; and complete 5.5 units of coursework. Professor Hankison is interested in the relationship between animal behavior and evolution. 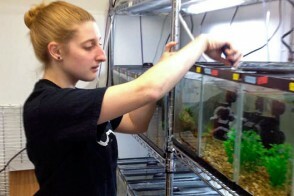 She currently is working with students to understand how courtship behaviors and mating preferences in fish correspond to paternity in offspring. Professor Tuhela-Reuning is a microbiologist and electron microscopist who manages the George W. Burns Scanning Electron Microscope Laboratory. She collaborated with students on research investigating how bacteria on bird feathers swim toward amino acids found in feathers. Professor Downing seeks to understand how humans impact the environment in both her research and in her teaching. She travels with students to places such as the Galapagos Islands and Caribbean coral reefs to explore biodiversity and study ecological interactions. Professor Hamill’s research and teaching interests include cellular and developmental genetics. She and her research students examine cell division and early development in nematode worms. Professor Carreno’s research focus is in parasitology involving arthropods, mammals, birds, fish, and other wildlife, and student research is thus split between the laboratory and the field. Students working with Dr. Carreno carry out projects in local, subtropical, and tropical environments. The Kraus and Bohannan nature preserves, 80 and 50 acres respectively, are close to campus. Many of our courses enable students to use these preserves for hands-on field experience. Several other nearby facilities within easy driving range provide internship opportunities, including the U.S. Department of Agriculture Laboratories, nearby hospitals, Stratford Ecological Center, Ohio Wildlife Center, veterinary clinics, and the Columbus Zoo and Aquarium. The Schimmel/Conrades Science Center offers top-of-the-line instrumentation, including a scanning transmission electron microscope, for advanced research projects. This fall semester research seminar for superior juniors and seniors majoring in the biological, mathematical, and physical sciences is held at the Oak Ridge National Laboratory in Oak Ridge, TN. It allows students to do research at the frontier of current knowledge. Contact Professor John Gatz.